FILE - Three F-35 Joint Strike Fighters fly over Edwards Air Force Base in this Dec. 10, 2011, handout photo provided by Lockheed Martin. Three U.S. senators introduced a measure Thursday aimed at blocking the transfer of Lockheed Martin's F-35 Joint Strike Fighter to Turkey, a NATO ally and one of nine partner nations involved in producing the high-tech, radar-evading aircraft. The bill, by Republicans James Lankford and Thom Tillis, and Democrat Jeanne Shaheen, comes at a time of deteriorating relations between the United States and Turkey, which supported the fight against Islamic State but has become increasingly worried about U.S. backing for Kurdish fighters in north Syria. The three senators, in introducing the bill, issued a statement expressing concern that Turkish President Recep Tayyip Erdogan had embarked on a "path of reckless governance and disregard for the rule of law." "Turkey's strategic decisions regrettably fall more and more out of line with, and at times in contrast to, U.S. interests. These factors make the transfer of sensitive F-35 technology and cutting-edge capabilities to Erdogan's regime increasingly risky," Lankford said in the statement. 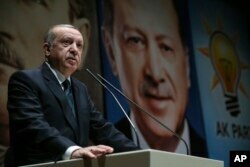 FILE - Turkey's President Recep Tayyip Erdogan delivers a speech at his ruling Justice and Development (AKP) Party conference in Ankara, March 30, 2018. Erdogan declared a state of emergency in Turkey following an attempted coup in July 2016. Since then, he has detained tens of thousands of people, cracked down on dissent, and carried out purges in the military and bureaucracy. He charges that followers of a U.S.-based cleric were behind the coup attempt. Erdogan has been a key U.S. ally in the fight against Islamic State but sent troops into the Kurdish-dominated Afrin region of northwestern Syria earlier this year and threatened to quash U.S. plans for a local security force in northern Syria. The three senators voiced concern about Turkey's detention of an American evangelical preacher, Andrew Brunson, a long-time resident of Turkey who was jailed during Erdogan's crackdown. "President Erdogan's choice to take hostages and imprison innocent Americans, to try to gain leverage over the United States, is egregious and unlawful," Shaheen said in the statement. Turkey plans to buy more than 100 of the F-35 aircraft. Turkish companies have been involved in producing parts for the fighter, and Ankara is scheduled to begin receiving its first aircraft within a year. The bill would restrict the transfer of F-35s to Turkey and limit Ankara from receiving intellectual property or technical data needed to maintain and support the fighters. It would allow the U.S. president to waive the restrictions by certifying Turkey is not taking steps that would undermine NATO security and not wrongfully detaining U.S. citizens.